A new adventure began for me yesterday! Drew and Luke and I went up to Joe’s Bike Shop where, after much research and penny-pinching, I was able to purchase my new Scott Speedster s40! And I LOVE it! 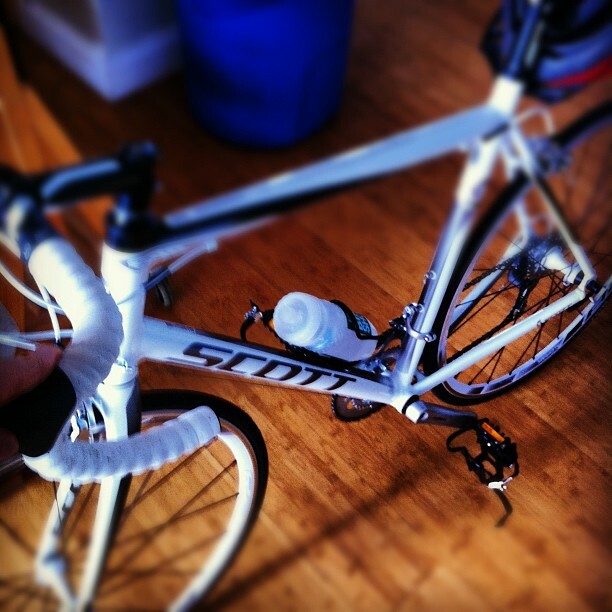 So begins a new endeavor for me: cycling. I’ve been dabbling in it for the better part of a year and taking spin classes at the gym and now I feel like I am ready to take the plunge. So the question arises: what do I do now? I am going to try to ride as much as possible and get used to this. My goal is to do the Pecometh Century in September. Anyone care to ride with me sometime? Any tips for this “newbie”? Tips: Read/watch videos on proper cadence. It will make all the difference. Though if you begin spin classes I’m sure they will teach you! Also, short with the added “Protection” will make all the difference in the world! and you will regret not having them once you start going on longer rides. the shirts are amazing too because they have pockets to carry your phone and wallet. Man! I would love to ride with you sometime. The fact we live in different cities may make that difficult though! Oh man! That would be fun! Move to the East coast! Congrats, by the way! Maybe you and the wife could make a trip out this way sometime!